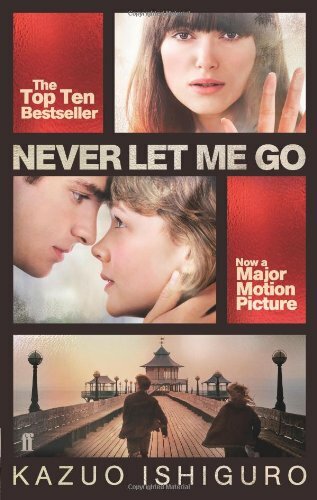 Holiday Book Review: Never Let Me Go by Kazou Ishiguro | What Does Mel Think? This was the first book I set myself to read on my holiday. It was recommended to me by my English teacher a while ago and I was eager to watch the film so, being me, I had to read the book first. Kathy is the story's protagonist, we follow her through her whole childhood and occasionally catch snippets of her in present life as a carer. We do not find out why she is a carer and what for until much later on in the book, I am not going to spoil that one for you! Her two best friends Tommy and Ruth also play a very central role and we get the pleasure of watching them grow up as well. It is really surprising how big of a time-scale this book manages to cover in only 288 pages. Kathy and her friends attend a boarding school called Hailsham and she begins probably in the middle of what in England we would call primary school and follows until she is well into adulthood. What I found enchanting about this book is just how relate-able the characters are. Some of the arguments and teasing that goes on whilst they are at Hailsham really takes you right back to being that age. I could remember having fights as they did about such feeble things as someone having a nicer pencil case than you that at the time feels like the most horrible thing anybody could ever do but you look back on it and laugh. Also the awe and respect you have for you teachers, thinking they are the most intelligent and incredible people in the world, but also the worst ones of whom you refer to with cruel nicknames behind their back. The only negative thing I can think to say is that the ending wasn't quite what I wanted it to be, I won't say why because I don't want to spoil it but it just really wasn't the resolution I wanted for the characters and it left the door open for you to wonder which in some ways I like, but in others it drives me absolutely crazy. Generally this was just a really enjoyable book to read and not too demanding, which was exactly what I wanted for my holiday. I would recommend this to anyone probably over the age of 15 in order to be able to look back at primary school in this way and not still be living through it. Also towards the end things get a bit deep and sinister with some inappropriate parts, so just to be safe this is what I would suggest. If you have read this book or would like to read it leave me a comment and let me know. When I have just read a book I love talking it over with someone because people read books in such different ways and end up with a completely different interpretation, so let me know yours! Viola's Christmas Blogger Gift Swap! © What Does Mel Think?. All rights reserved.